Companies developing safety critical systems realize the importance of functional safety, and the international standards that regulate this field. One of the most important among these is the umbrella standard IEC 61508. 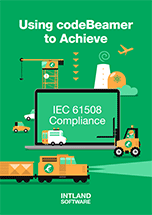 This document analyzes IEC 61508, and proposes ways to facilitate compliance with its requirements. As a parent standard of various other regulatory standards in the fields of railway software, automotive software, process industries etc, IEC 61508 governs the functional safety requirements of Electrical/Electronic/Programmable Electronic Safety-related Systems. With its integrated approach and advanced safety- and risk-related feature set, codeBeamer ALM is a cost-effective solution to meet the requirements set forth by IEC 61508, giving companies a competitive advantage. The safety-related features of codeBeamer have been developed employing the same risk-based approach that IEC 61508 follows. Thanks to its advanced risk management functionality, codeBeamer helps identify, analyze and plan the mitigation of risks related to functional safety. What’s more, using codeBeamer, you’ll be able to derive requirements from the identified risks and trace them through to testing, ensuring end-to-end traceability and increasing trust in your processes. This guide helps you understand how exactly codeBeamer could help you comply with the requirements set forth by the standard IEC 61508, linking modules and features of the ALM tool to the requirements stipulated by IEC 61508.